Showtime can enhance his stallion value is he can add the G1 Memsie Stakes to his P B Lawrence win. Showtime will put his future as a stallion on the line when he tackles Group One company at Caulfield. 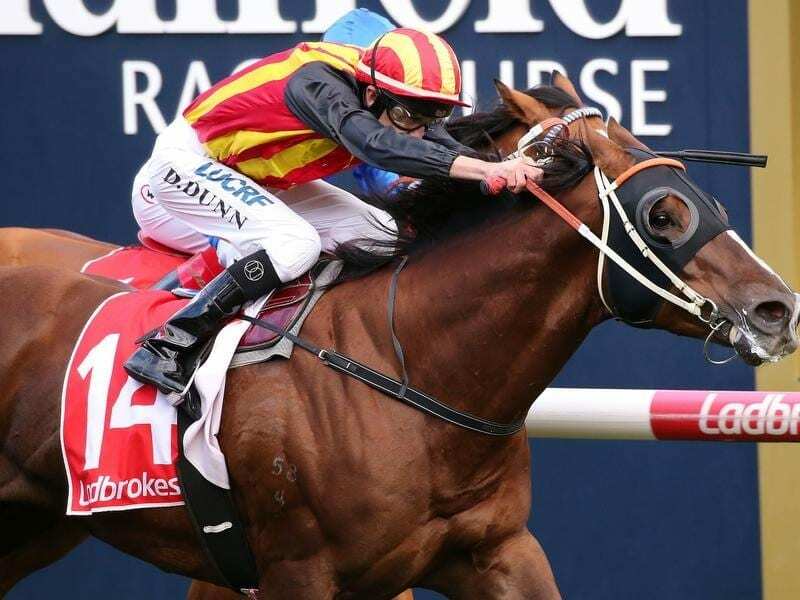 The Hawkes Racing-trained horse contests the Memsie Stakes (1400m) off a last-start victory in the Group Two P B Lawrence Stakes over the same course and distance as Saturday’s race. Co-trainer Wayne Hawkes says it is vital the four-year-old, part-owned by Arrowfield Stud, secures a Group One win so he can join his sire Snitzel ans his grandsire Redoute’s Choice at the stud. Despite the Lawrence success Hawkes concedes it is a greater challenge on Saturday but says the 1400 metres is ideal. “You can have the same horses running as last time to the same horses running this week and the pressure’s three times as strong,” Hawkes said. “Then you add in Vega Magic and a couple of those horses. “It’s a Group One race worth a million bucks. They don’t give them away and he’s going to have to earn it. “But his 1400-metre record at Caulfield is outstanding and his only blemish was in the Guineas last year when he got four-back the fence and got crashed into. Showtime has drawn barrier two on Saturday which Hawkes says allows Dwayne Dunn to take a forward position, as he did in the Lawrence. And while the race sets up differently with the added contenders, Hawkes says Showtime has trained on well since the victory. “He’s drawn a good barrier (2) and you know he’s going to jump and he’ll either be leading or box-seating like he did the other day,” Hawkes said. “And he looks outstanding. He looks like a stallion now whereas before he looked a bit immature. Whereas Showtime was well supported to land the Lawrence Stakes, he has so far been easy in betting since final declarations on Wednesday, drifting from $10 to $11 on Thursday. Last year’s Memsie winner Vega Magic, to be ridden by Damien Oliver, has firmed from $2.90 to $2.80 while the most support has come for Sydney visitor Happy Clapper who has gone from $7 to $5.50. Kementari remains steady as the $4.40 second favourite while the only other runner at single figures odds is Grunt at $9.